Peel and dice onion, carrot, parsley root, and celery root. Peel and finely crush garlic. In a large pot, heat olive oil over medium to high heat and add diced onion, carrot, parsley root, and celery. Sauté until golden brown, then add crushed garlic and sauté for 1 - 2 min. more. Add vegetable broth, salt, and chickpeas and let simmer on medium-low heat for approx. 1 hr., or until chickpeas are soft. Remove one ladle of chickpeas and cooking liquid, transfer into a small pot, and set aside. Drain half of the cooking liquid from the large pot and set aside. Using an immersion blender, puree chickpeas and remaining cooking liquid until smooth. Add more of the reserved cooking liquid, if needed. Season to taste with salt and pepper and keep warm. In the small pot, bring reserved chickpeas and cooking liquid to a boil and add spinach. Season with salt, pepper, and cumin. Let simmer until the spinach wilts, stirring occasionally. 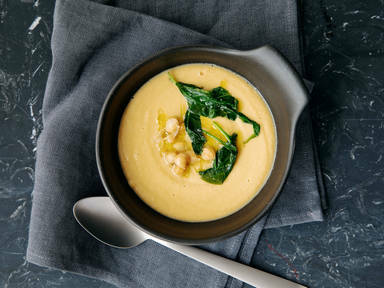 Serve hummus soup with chickpea-spinach mixture. Enjoy!